Welcome to Fish Window Cleaning! We are your local window cleaning company with a national presence. We serve Fort Worth, Keller, Hurst, North Richland Hills, Lake Worth, Benbrook, Richland Hills, Everman, Watauga, Eagle Mountain, White Settlement, Westworth Village, Haltom City, Westover Hills, Forest Hill, Blue Mound, Saginaw, Burleson, and Cleburne, TX. Eric Silver, owner of Fish Window Cleaning Fort Worth, TX, was featured in Entrepreneur's "Franchise Players" column. Click here to read his story! 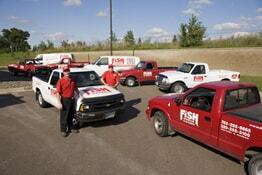 At FISH Window Cleaning of Fort Worth, we clean both commercial and residential glass. We also clean chandeliers, coach lamps, mirrors large and small, as well as awnings and other coverings. While our name indicates that we clean glass in Fort Worth, you may also find us cleaning your neighbor's business in Keller, or your colleague’s residence in Aledo. We clean residential and commercial glass as far west as Weatherford, north to Azle, Springtown and Rhome, east as far as Hurst, and south all the way to Granbury and Cleburne. We also provide pressure washing service so you don't have to worry about the headache of scheduling pressure washing and window cleaning so they don't interfere with each other. The added benefit is that you only have one company to deal with! Let us come by and give you a free on-site estimate. It would be our pleasure to add you to our list of satisfied customers. Contact us today at 817-732-9595!